Radio over IP technology (RoIP) allows the convertion of traffic channel PMR (Professional Mobile Radio) and then transfer it into IP packets as Ethernet traffic over a LAN, WAN, WLAN. 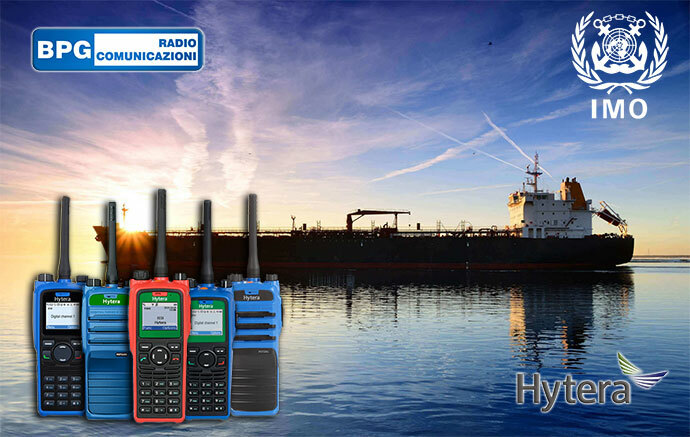 This technology radically changes the ways in which interconnect analog and digital radio systems, reducing costs and offering new services such as interoperability and geographical centralization of communications. 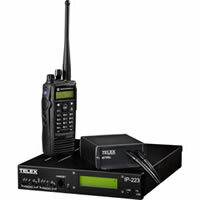 The main advantage of a RoIP TELEX VEGA control system is modularity, which allows in an extremely flexible way, to create an array of radio controllers capable of handling and interconnect by a minimum of two radios up to theoretically infinite two-way radios. 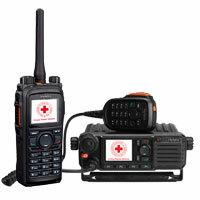 RoIP VEGA realizes the IP convergence of professional radio communications. Distributes radio signals across the IP network and turns any PC into a virtual radio. 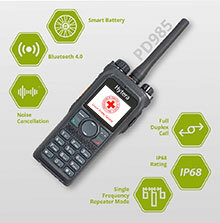 RoIP VEGA can integrate PMR radio networks of any kind, even if already deployed, managing reports of selective calls, without requiring any modifications to the existing radio. RoIP VEGA can connects different radio networks (PMR, DMR, TETRA), even on different frequency bands (HF, VHF, UHF), offering a simple the centralization of radio stations from a single room operation (function adopted by airports). 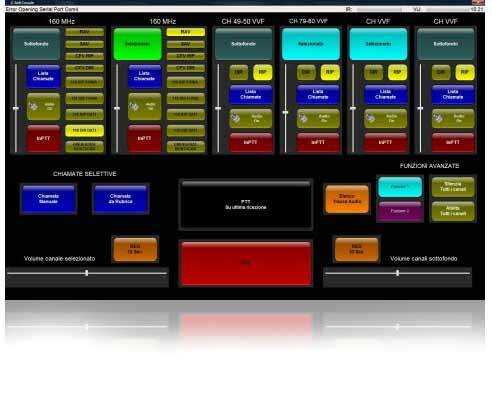 RoIP VEGA allows the centralization of radio stations from a single room operation(recently adopted by several private security). The radio adapter VEGA IP-223 is a reliable and safe interface to control one or two remote radio devices via IP connection. The adapter can be managed from a operation center RoIP using Windows software console; the programming of the IP-223 module is made through its web interface. 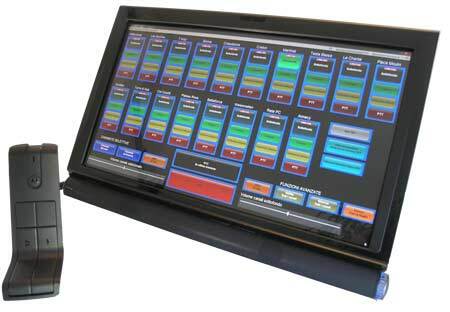 The software console is based on the application Vega C-Soft, which allows the operator to communicate using PC sound system and its network connection. 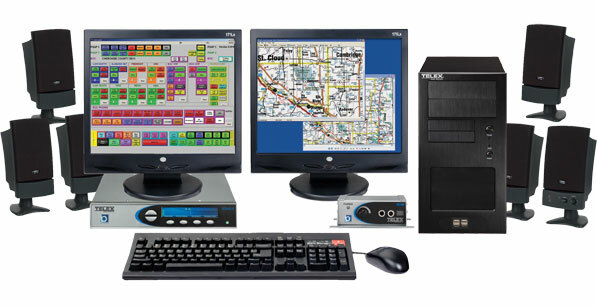 With the VEGA RoIP system you can centralize communications from various remote locations, geographically spread over large areas, on one (or more) Operative center. 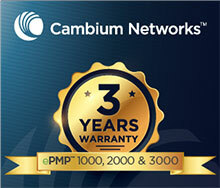 Through ADSL network, you can converge PMR communications on an infrastructure IP-based. On the remote position, the system includes the connection through the local radio module IP223 and the presence of routers connected to an ADSL line to transfer WAN radio communications through RoIP technology to the Operation center. 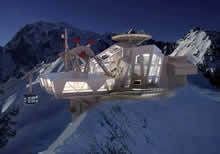 The Operations Centre, as well as being equipped with C-Soft application, must also have ADSL connection and a router to receive its data traffic coming from remote stations. 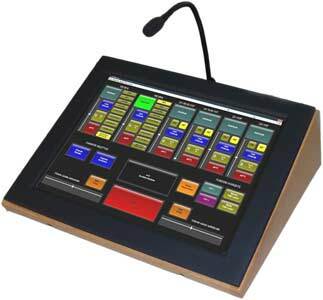 The operator can employ a variety of options available, from headphones microphones directly connected to the computer to more comfortable and immediate solutions that involves the use of professional table microphones. HB3+ is an audio adapter that connects to a personal computer via an RS232 serial port and audio lines in and Line-Out Audio in the sound card of the computer. 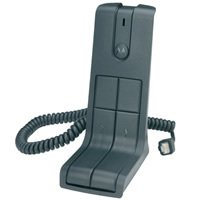 This adapter allows the connection of a professional desktop microphone, headset microphone and up to 2 speakers for the subdivision of the various lines on them. 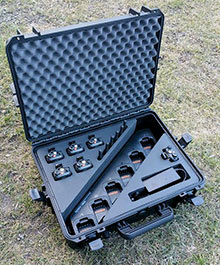 There are also contacts for external foot PTT and general digital inputs / outputs. 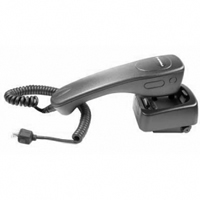 This adapter allows the connection of a professional desktop microphone, headset microphone and up to 6 speakers for the subdivision of the various lines on them. 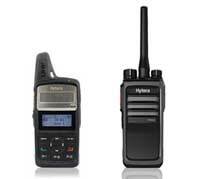 Combining the MTRBi adapter to the IP223 , the attendant is able to handle all reports of the new MOTOTRBO DMR radios. 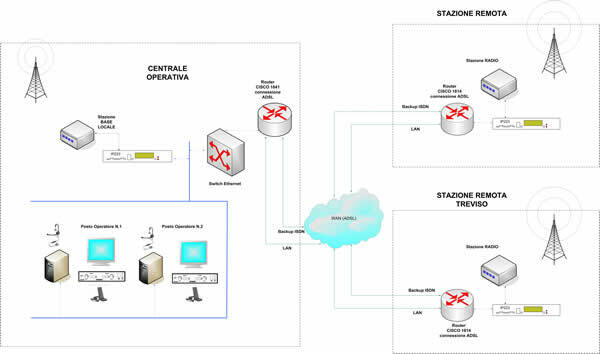 In the example, the operations center composed by two operators places, is able to manage a local radio stations and two radio stations in different geographical areas.